Roger Author GFX Related / 3D and 2D Tuts. Getting a high-resolution mesh ready to be used in game can be a tricky, but very important part, of the process. 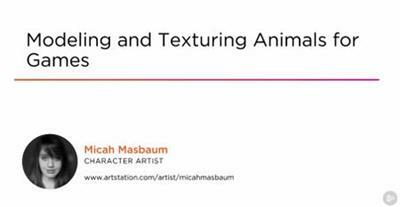 In this course, Modeling and Texturing Animals for Games, you'll go over all of the steps necessary to create a game-ready mesh from the sculpt you created previously. You'll start off by creating the low-resolution mesh from the sculpt. Next, you'll create the UVs and transfer the high-resolution detail to the game-ready mesh by baking the maps. Finally, you'll focus on texturing and creating the final presentation for the character in Marmoset Toolbag. When you're finished with this course, you'll have a foundational knowledge of getting a high-res mesh ready for games.